Originally created in the 70s as a reservoir to supply local agriculture, the lake at Villeneuve-de-la-Raho quickly became a leisure area for sailing, fishing and sunbathing, attracting growing numbers of locals and tourists alike because of its easy access. 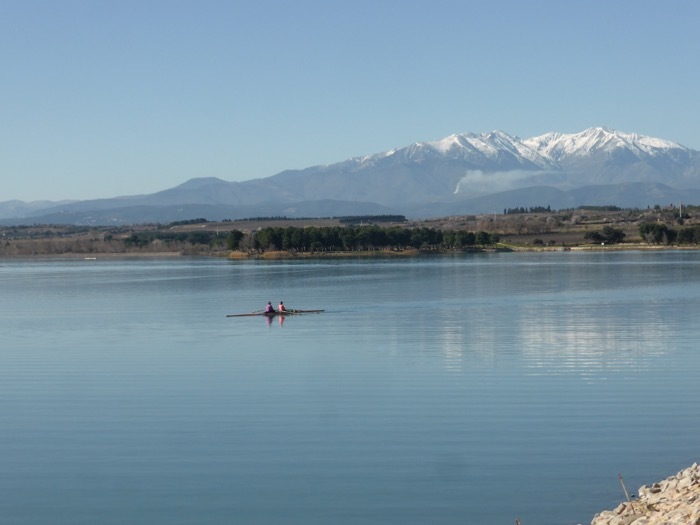 Only 15 minutes from Perpignan centre (direction Porte d’Espagne/Barcelona) this lake is used all year round for walkers and joggers, and also provides the water necessary for the ’canadairs’ in case of forest fires. The lake is made up of three main parts: a smaller lake for swimming in summer, a much larger fishing lake and a ‘reserve écologique’ of 15 hectares. It is a delightful late autumn or early spring walk, with benches and tables around the large lake, perfect for a convivial winter picnic, never too far from the car park if you need to make a run for it! Recommended for: Anybody. The shorter walk is pleasant and flat with a café in sight at all times for refreshment in summer when heat exhaustion threatens! (Beware: there is not much shade on this walk): The longer walk is also flat with more shade. Café and facilities are not open in winter, but this is a very pleasant winter walk nevertheless. Heading from Perpignan towards Porte d’Espagne/Le Boulou, follow signs for Villeneuve de la Raho. There is plenty of parking space when you arrive at the ‘lac’ which you can’t miss, either on lakeside itself or across the road. From the car park on lakeside, start walking around the lake anti clockwise. 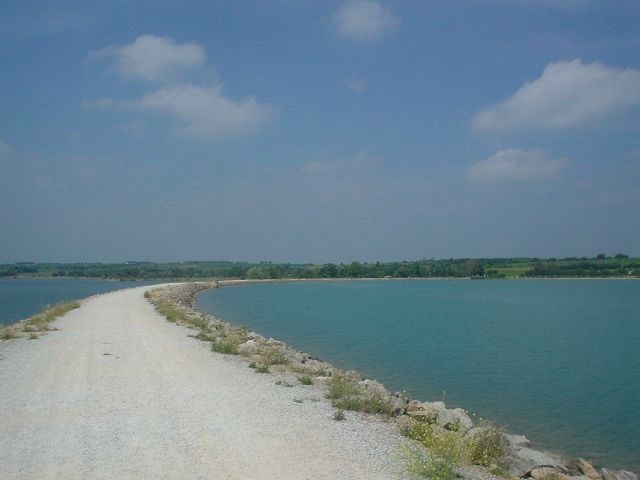 This walk is particularly nice for families with young children in summer as there are trampolines and water chutes at the beginning of the walk, plenty of places to eat and drink, and the lake is supervised for bathing. Out of season, these facilities are closed. Out of season, it is a lovely autumn or early spring walk, with benches and tables around the large lake for a picnic. 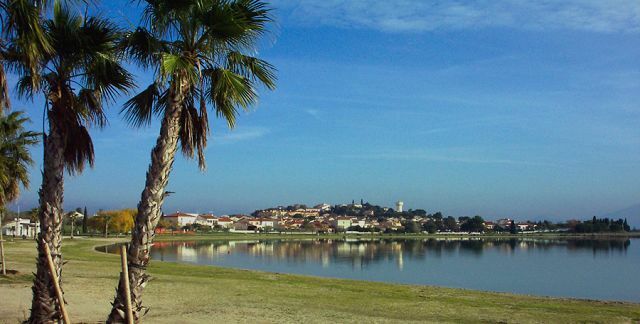 Villeneuve-de-la-Raho is more of a ‘village dortoir’, its residents probably attracted by the picturesque lake surrounded by vines as much as it’s easy access to Perpignan and public transport. New housing developments make up much of the village, whose centre offers a handful of necessary shops, takeaways….in fact everything you need but no more. Other than the lake, Villeneuve’s main claim to fame is as the birthplace of Alfred Sauvy, demographer, anthropologist and historian who apparently coined the term ‘Third World’ (‘Tiers Monde’). Not too excited about demography and anthropology? Well, you’re in luck. After your lakeside walk, head away from the lake towards Pollestres and Perpignan, and pay a visit to Chateau Cap de Fouste. This wine domaine was founded in the last century by the wealthy Bardou Job family who made their fortune with the invention of ready to roll cigarette papers. The name, Cap de Fouste goes back two hundred years. The domain was actually built on the edge of the large forest surrounding it, and so named, ‘L’orée du bois’ or in Catalan ‘Cap de Fouste’. A slow stroll or a brisk trot around the lake on a cold clear day, followed by a tasting in the warmth of an ancient winery? Now that’s winter in the P-O!